I've been trying this week to get a grip on the science of the Greenland Ice Sheet. It's a complex and poorly understood business, but there seems to be enough meat here that I think it should be on The Oil Drum agenda. We might do worse than start with with a report from the BBC. They covered a talk at the American Geophysical Union meeting in San Francisco this last week. (I didn't get to go, alas). Kangerdlugssuaq Glacier on the east coast of Greenland has been clocked using GPS equipment and satellites to be flowing at a rate of 14km per year. It is also losing mass extremely fast, with its front end retreating 5km back up its fjord this year alone. The glacier "drains" about 4% of the ice sheet, dumping tens of cubic km of fresh water in the North Atlantic. First, some basic statistics. The CIA reports that Greenland has an area of 2.2 million km2 -- slightly more than three times the size of Texas -- and a population of 56,375 humans. Greenland is a self-governing colony of Denmark. A "flat to gradually sloping icecap covers all but a narrow, mountainous, barren, rocky coast". The ice sheet covers about 80% of the land, and contains about 2.5 million cubic kilometers of ice. If all that ice were to melt, it would increase global sea level by about 7m, or 23 feet. For Greenland, estimates of the sensitivity to a 1°C local warming over the ice sheet are close to 0.3 mm/yr (with a total range of +0.1 to +0.4 mm/yr) of global sea level equivalent. Given warming of a few degrees over Greenland, that's at most a few tens of centimeters of sea level rise due to Greenland ice between now and 2100. That can't be too bad, right? Snow falls on it and makes it thicker. In the summer, the top melts, the water runs away, and the sheet gets thinner. The ice flows a little faster or slower depending on the thickness of the sheet. It's now starting to look like this misses the most important physics. Figure 3. (A) Horizontal ice velocity (red curve) along a smoothed line of motion showing ice accelerations during the summer melt seasons and the abrupt transitions to deceleration around the times of melt cessation. The cumulative additional motion (horizontal residual, black) relative to a wintertime-average velocity of 31.33 cm/day is 6.0 m by the time of the maximum velocity in 1999. (B) The vertical residual (blue) indicates a 50-cm uplift at the time of the 1997 transition from accelerating flow to decelerating flow. (C) Cumulative PDDs and PDDs for 10-day intervals (10d DD, red) from temperatures measured at the Swiss Camp, showing correlations of the melting with the intensity and timing of the ice accelerations and decelerations (units are degree-days). Vertical dotted lines mark May 1, July 1, and September 1 for each year. The picture that emerges is that in the summer, the top of the icesheet starts to melt, this water heads down various vertical channels (moulins) and crevasses, and ends up lubricating the motion of the ice sheet at the bottom, where it grinds against rock. Now, the amount of motion in the Zwally paper is quite small (32 cm/day increasing to 40cm per day), but what is striking is that the effect seems to turn on from almost nothing in less warm years to quite pronounced in warmer years, leading one to wonder how the effect might scale in the future with yet more warmth. Someone who's been worrying about that a lot is James Hansen, director of the NASA Goddard Institute for Space Studies. In a series of papers (with collaborators) in Scientific American, in Climatic Change, and in Science, he lays out his concerns. The first thing that needs to be understood is that climate change has been extremely rapid in the past. Recent results from Antarctic ice cores further extend the idea that temperature and composition of key global warming gases vary rapidly at times in the past. This graph covers the last 650,000 years with seven major glaciations in (times when ice sheets cover much of North America and Europe). CO2, CH4, and dueterium percentage (a proxy for temperature) as a function of years before present. Click to enlarge. Source: RealClimate Note in particular that ice ages typically end very sharply - eg the most recent one ending 20,000 years ago (the figure is plotted with time going backwards to the right). Now it turns out that this also translates into the ice sheets melting rapidly and sea level rising rapidly. Sea level rise since the last glacial maximum. Click to enlarge. Source: Wikipedia Over the full 10000 years or so after the icesheets of the last ice age became unstable and started to melt, sea level rose about 120m - a rate of around 1.2m/century. Obviously in the Holocene (the flat sea-level plateau since 8000 years ago), things have been remarkably stable, and it is in that period that humans have built civilization. The remaining Greenland and Antarctic ice sheets have clearly been stable at Holocene temperatures. The maximum rate of change during the deglaciation occurred during Meltwater Pulse 1A (about 14000 years ago) and was around 5m/century. There is controversy over whether this pulse is primarily due to melting of the ice sheets in North America, or portions of those in Antarctica. However, either way it's an indication that when big ice sheets go, they can go with a rush. The dominant issue in global warming, in my opinion, is sea-level change and the question of how fast ice sheets can disintegrate. A large portion of the world's people live within a few meters of sea level, with trillions of dollars of infrastructure. The need to preserve global coastlines sets a low ceiling on the level of global warming that would constitute dangerous anthropogenic interference. The history of the earth and the present human-made planetary energy imbalance together paint a disturbing picture about prospects for sea-level change. Data from the Antartic temperature record show that the warming of the past 50 years has taken global temperature back to approximately the peak for the current interglacial (the Holocene). The is some additional warming in the pipeline that will take us about halfway to the highest global termperature level of the previous interglacial (the Eemian), which was warmer than the Holocene, with sea level estimated to have been five to six meters higher. One additional watter per square meter of forcing, over and above that today, will take global temperature approximately to the maximum level of the Eemian. The main issue is: How fast will ice sheets respond to global warming? Given the present unusual global warming rate on an already warm planet, we can anticipate that areas with summer melt and rain will expand over larger ares of Greenland and fringes of Antarctica. Rising seal level itself tends to lift marine ice shelves that buttress land ice, unhinging them from anchor points. As ice shelves break up, this accelerates movement of land to the ocean. Although building of glaciers is slow, once an ice sheet begins to collapes, its demise can be spectacularly rapid. Since Hansen wrote those words, it has now been tentatively reported from satellite measurements that the net mass loss of Greenland Ice recently is as follows. Estimated ice mass loss from Greenland in cubic kilometers. Click to enlarge. Source: Real Climate This is the quantitative story behind the BBC report that we began with. Now, compared to the total amount of ice on Greenland -- 2.5 million cubic kilometers -- these are still very small numbers. On the other hand, the volume appears to be growing super-exponentially (ie the doubling time is reducing as we go). If that continues, it won't take many decades for the mass-loss to reach a volume that really matters. On the third hand, you can extrapolate three points just about any way you want. There certainly is not scientific certainty that Greenland will melt to an important degree in the twenty-first century. But at this point, scientists are no longer ruling it out, either. For perspective, here's an EPA map of the portions of the US east coast that would be inundated by 1.5m and 3.5m of sea level rise. 3.5m would be reached halfway through a Greenland icesheet collapse. As you can see, the total area isn't that large, but it includes a pretty large fraction of many of the east coast's coastal cities. That would be expensive. Areas of the US affected by varying sea level rises. Click to enlarge. Source: EPA Perhaps the greatest danger is the time lags in the system. There are the time lags in the climate itself - because the ocean is very slow to warm up, the earth still has not reached equilibrium with the greenhouses gases we already have put into the atmosphere. Inbound sunlight is exceeding radiation to space by 0.85+-0.15 W/m2. The earth probaby has around 0.6 degrees centigrade (roughly 1 degree Fahrenheit) of additional warming just to catch up with what we've already done. But perhaps more importantly, this level of imbalance is believed to be far greater than what drove deglaciations after ice ages in the past. That raises the fear that ice sheets could collapse faster than ice sheets in the past too. Then there's the time for humanity to swap out it's fossil fuel economy and replace it with whatever we would do instead, which has to be decades at minimum. The big risk is that we will set in motion something unstoppable before we see overwhelmingly clear evidence of it. At any rate, what is clear is that the Greenland icesheet melting very urgently needs to be understood. In particular in contemplating tar-sands, coal-to-liquids, etc, as solutions to peak oil, we need to understand what gamble with the ice sheet we are making, exactly. Wow, what a horrible December with evacuations in Vanuatu from raising ocean levels; the report on Atlantic Circulation, and now this. Seems like alternative sources of oil is not enough, we need enviormentally friendly renewable energy. Troubling, indeed. And why would they be evacuating Vanuatu, when the average sea level there has been below nominal for the past 3 years? Erosion. And wind piling effect. Check their history, this is not their first evacuation in the last 100 years. Why isn't there any satellite data from before 1996? Surely we have had satellites up there before this date? 200 km2/year of melting seems really small compared to 2,500,000 km3 of ice, are you sure this is correct? The 215km^3 is net loss of ice (roughly, net loss = melting + icebergs - snowfall). If the climate were perfectly stable and the ice sheet in equilibrium with it, this number would be zero. On the satellites. These results come from Synthetic Aperture Radar (more here) which has not been around that long. That would possibly give one more data point, stil not enough to extrapolate the curve. Water expands when freezing, did you take that into account? The news are alarming. It is not quite clear why the changes have become so rapid only recently. We know that world fossile energy consumption has increased a lot lately - the rapid growth of oil production and spectacular increase in the Chinese coal consumption may have something to do with this. And may be also stricter anti-pollution measures in the US and Europe, which is decreasing the global "dimming", i.e. less particles in the atmosphere means more sunlight put-through. There is not much that can be done - and that would have an immediate effect. But starting to develop alternatives and renewables is definitely not what is needed. A shock increase in fuel taxes would help quickly. Tripling gasoline prices would probably cut driving by half - without collapsing the rest of economy. Rationing would do also. Removing filters from power stations would restore the dimming effect. This kind of actions are fully feasible and they have been tried earlier. Seeing this as as a national security crisis - like war - would make all this possible. Europe did experience very dramatic decline of fossile fuel consumption during the WWII, without social collapse. This was not nice - but tolerable. China and India could be brought in by threatening by tariffs and by the view of cheaper import oil. This was to say that effective counter-measures are in fact possible. The difficult point here is of course assessing the seriousness of the problem. Are we really heading for a "threshold effect" i.e. rapidly accelerating change? Tripling gasoline prices would probably have pretty minimal effects on driving. What happened in WWII (which was very significant as you say), took actual rationing. I'm not sure this is the case. When making decisions, consumers take the current situation into account AND expectations of the future state. If prices of gasoline tripled tomorrow and were generally expected to stay at the tripled level indefinitely, consumers would now start taking this into account when considering what kind of car to buy, whether to take a job across town or right down the road, whether to move far out into the 'burbs or whether to stick near to good public transportation, etc. There would be a short term effect as people immediately reduce their discretionary driving, and then a larger longer term effect which would manifest itself over years. Contrast the above scenario to another situation in which a "crisis" triples gasoline prices but when the crisis abates prices are expected to drift back to current levels. In this situation there would again be some short term demand reduction as people reduced their discretionary driving but the longer-term reduction would be substantially reduced as consumers would base their decisions on the expectation of prices falling back to the current level. I suggest you read a bit about the Dutch "Hungerwinter". The Netherlands were occupied. The Germans exported a lot of food etc. The unoccupied countries did better. What I wanted to say is this: drastic reduction of greenhouse gases is possible if it is necessary. If the global climatic balance is really "tipping over" the pain from severe rationing and other emergency measures to reduce oil, gas and coal use is smaller than the consequences for not doing that. If we have some time left, energy depletion will do the trick in 30 years or so. ASPO scenario shows an imminent peak of oil, NGLs and natural gas. It is quite likely that coal production cannot increase much in the future. Coal peak is likely in 30 years time. No Tokyo II is needed. Depletion will do it much better. But if we are really in an emergency, other kind of solutions are needed. This is the big question. The Netherlands were occupied. The Germans exported a lot of food etc. No they didn't. This was a transportation issue. It started with a strike of railway workers and as a punishment the Germans forbade transportation of foods for about a month. Then the winter kicked in but foodstocks were low. The combination of low foodstocks caused by the monthlong emargo and the lack of transportation capabilities, due to lack of fuel, after that caused the famine. They also built over a million civilian gasifiers because the military used up the gasoline. Global sea level rise coupled with declining river flows in glacial-fed riparian systems representing the drinking and irrigation water several billion folks require will spawn massive population shifts and economic upheaval--all of which will be exacerbated by peaking oil and gas. ANYTHING anybody does to conserve and overthrow "business as usual" will be beneficial, no matter how small. "ANYTHING anybody does to conserve and overthrow "business as usual" will be beneficial, no matter how small." No. If the situation is really threatening immediately with a "trigger event", massive scale obligatory measures are needed. It is not saving somebodys conscience but the world... If we have time, depletion will take care of conservation and our business is to manage the social and economic consequences. OK, we will see. I doubt that there is not yet enough evidence to declare an emergency. So we will wait a little bit. But if the world temperatures rising continues at the present pace in three - five years, the situation will be reconsidered. There are the time lags in the climate itself - because the ocean is very slow to warm up, the earth still has not reached equilibrium with the greenhouses gases we already have put into the atmosphere. Inbound sunlight is exceeding radiation to space by 0.85+-0.15 W/m2. The earth probaby has around 0.6 degrees centigrade (roughly 1 degree Fahrenheit) of additional warming just to catch up with what we've already done. ...and the atmospheric concentrations of greenhouse gases continue to increase - currently at 1.9 ppm per year - so it's pretty likely that average temperatures will continue to rise at the present rate or greater. Hansen argues in his Climatic Change editorial that major disintegration of the world's ice sheets will be unavoidable once the loss of ice passes some critical point. Coastal low beach waterfront is looking a risky long-term investment at the moment. Speaking of the Southern hemisphere, why has Nasa said that Antartic Ice cover has INCREASED over the last 25 years? And while we are down here, how about the fact that NZ's National Institute of Water and Atmospherics (NIWA) has measured increases in NZ glaciers over the past five years. Satellite data for the middle atmosphere since 1978 has shown no warming and even an overall cooling of the atmosphere. I guess what I'm trying to say here is that looking at individual trends of small parts of our earth is not a useful way to detect the global trends. It's like trying to predict world oil production by looking at what's happening at one oil field. Did you actually read the articles? or are you just spreading doubt? "The Antarctic sea ice changes match up well with regional temperature changes," Parkinson said. "The one region in the Antarctic where the temperature records have shown prominent warming over this period is the Antarctic Peninsula, and indeed it's immediately to the west and east of the Antarctic Peninsula, in the Bellingshausen/Amundsen and western Weddell seas, respectively, that the sea ice seasons have been shortening rather than lengthening." "The recent gains do not compensate for the large overall losses seen over the past century. The iconic Franz Josef glacier is still much shorter now than in 1900, and the volume of ice in the Southern Alps dropped by about 25-30% last century. This is linked to an increase in regional mean temperatures of 0.7°C." Globally, most glaciers are retreating as the Earth warms. Of the glaciers for which there are continuous data from the World Glacier Monitoring Service, the mean annual loss in ice thickness since 1980 remains close to half a metre per year. The Service has said that the loss in ice mass "leaves no doubt about the accelerating change in climatic conditions". The giant West Antarctic ice sheet, long the subject of warnings about its continuous melting and collapse, is actually getting thicker in parts. However no-one is sure how long the change will last. A new radar study shows that the ice sheet feeding the Ross Ice Streams is growing. That is a dramatic change in an ice sheet covering about a third of West Antarctica and that has retreated nearly 1300 kilometres since the end of the last ice age. The big question is if the change marks the end of the retreat, or just a short-lived reversal. Since 2002 it has only worsen. About the last comment about record low temperatures in some region of the world (part of the US) at some time (winter 2005) I won't even comment. Sorry, but I must conclude you are spreading lies like all climate change "sceptics". You are the one who takes examples of very particular regions and times, and put it forward as proof that there is doubt. Science doesn't work that way, it takes data from 1000s of regions at 1000s of different dates to draw conclusions. If the climate changes catastrophically in the future you, as well as all the climate change naysayers will be responsible for humankind not having taken the appropriate measures in time. Shame on you. "You are the one who takes examples of very particular regions and times, and put it forward as proof that there is doubt"
Sorry, but you seem to have missed the gist of my argument. The articles I quote DISPROVE global warming as much as Stuart's post about Greenland PROVES global warming. In other words, we have no real idea whether the trends in polar ice are part of natural cycles or are part of a worsening global trend brought on by man. Any attempt by us to debate it here at TOD (a blog about Peak Oil) is absolutely futile and a waste of the elctrons used to transmit it! I am a committed environmentalist who voted for the Greens here at the last election. There are incredibly more important issues to discuss (and act on) about the environment without having to worry about whether global warming is directly related to man's activities. Issues such as pollution, loss of biodiversity, deforestation, are all far more visible problems that we can actually make a difference with today. We may be able to reduce our C02 emissions by 20%, but do we actually know it will make a difference? In fact, our efforts to reduce CO2 emissions by one or two billion tonnes pales into insignificance when you realise that (according to the USGS) "Volcanoes release more than 130 million tonnes of CO2 into the atmosphere every year". Are we going to shut down all the volcanoes, too? Maybe the countries with more volcanoes will have to pay more carbon taxes? We'll be really screwed if we reduce our CO2 emissions and then we get some extinct volcanoes starting up! While we worry about whether the Gulf Stream will flip or whether Greenland's Ice will all melt (things that we can do very little about), we're losing hundreds of endangered species every day, water quality deteriorates before our eyes and natural habitats are swallowed up by urban sprawl. Finally I would like to say that there are many other places to discuss Global Warming, and I do not believe that TOD should be added as yet another. While there may be a link between post-peak activities and increases in CO2 emissions, the link between the latter and Global Warming can be debated elsewhere. We need to stick to the topic at hand: Peak Oil. My goal in the post was not to prove global warming. My goal in this post was to explore some of the issues that one has to understand to assess one particular risk of further warming (melting in Greenland). That significant anthropogenic global warming exists is now irrefutable to anyone who makes a serious effort to look into the evidence in an open-minded manner. I won't spend time offering remedial coverage on that topic because it isn't very interesting to me. If you would prefer to read reassuring nonsense from people funded by industry PR campaigns in an attempt to paralyze action, there are lots of right wing websites that will be happy to begin supplying you with regular doses of that. I view climate change as a critical component of the peak oil debate - we cannot explore the implications of CTL versus nuclear/wind powered plug-in hybrids, for example, without considering the climate issues. Volcanoes have been a regular part of the planet's ecosystem for billions of years. Life has adjusted to these CO2 releases which are balanced by carbon being absorbed into the mantle via subduction zones in deep ocean trenches. Life adjusts to changes over time periods of at least 100,000 years. Current CO2 levels are the highest in at least 400,000 years and most of the increase has come in the last 60 years. This increase tracks closely with increases in global fossil fuel use. Peak Oil can seriously worsen this situation if we turn to using coal even more. Simple economics says this is the way to go. Even the choices of Chinese Communists show that they follow simple economics in decision making. What does simple economics say we should do about the effects of rising sea levels on New York City? Move the people elsewhere or build dikes and go back to calling it New Amsterdam? The United States, alone, produces over 7.3 *billion* tpa of CO2 into the atmosphere each year. So volcanoes produce 1.8% of the CO2 that the US, alone does. And the US is only 2/7ths of world emissions of CO2 (then there are another 2bn tpa carbon equivalent, ie 7 bn tpa of CO2 equivalent, stemming from non CO2 greenhouse gases). Volcanoes *do* effect the climate, mostly by (temporarily) abating global warming by blocking sunlight with atmospheric particles and SO2. When Pinatubo erupted the world experienced a 0.5 degree centigrade fall in average temperatures, over the next 18 months. Which was perfectly predicted by the (relatively primitive) climate models then in use. Old data, mate. I can't speak for the NZ glaciers, but antartica ice is rapidly deteriorating presently. Perhaps you have some newer data that you can point us to? How about the report published in "Science" in June this year that stated that (quoting from the Wikipedia sea level rise page) "East Antarctica thickened at an average rate of about 18 mm/yr while West Antarctica showed an overall thinning of 9 mm/yr". According to the abstract, the East Antartic ice "increased in mass by 45 ± 7 billion metric tons per year from 1992 to 2003". That doesn't seem like it is "rapidly deteriorating". DuncanK, your "Science" article contains data from 1992-2003, and on the Eastern Antarctic ice sheet, at that. Sea levels are not falling from more snow falling on Eastern Antarctica. But they are going to rise from the collapse of the WAIS, something even your cited source covers! "Temperatures [on the Antarctica continent] there have risen by up to 4.5 degrees Fahrenheit (2.5 degrees C) in the past 60 years -- faster than almost any region in the world. In the past 30 years, ice shelves in the region have lost more than 5,200 square miles of area." I believe Stuart Staniford said it best regarding remedial climate awareness education. Confucious once said that if you look for something hard enough, you will eventually find it. If you want to find "source material" to contradict the generally accepted scientific opinion, you will. But that does not make it any less true. "your "Science" article contains data from 1992-2003"
Yes, but the report was published in June 2005, which is newer than any of your articles. Most of the articles you quote don't say hold old the data is that they are based on, so you cannot say that this is new data. "Sea levels are not falling from more snow falling on Eastern Antarctica." Why not? If warmer seas are generating more clouds (there's certainly more hurricanes, which have lots of clouds) and those clouds fall as snow on the East Antartic ice shelf, then H2O molecules have been directly transferred out of the ocean and onto the land. That sounds like the sort of process that would lower sea levels. And as Dave pointed out, this may also be happening on Greenland. The CommonDreams article is actually only about the Antartic peninsula (in the west) which is indeed warming up. In fact, you cleverly changed the quote from the article. The paragraph you snipped actually reads: "The affected area is at the far northern tip of the Antarctic, just south of Chile and Argentina. Temperatures there have risen by up to 4.5 degrees Fahrenheit (2.5 degrees C) in the past 60 years". I certainly do not dispute that the peninsula has warmed up, in fact, it makes sense if the oceans have warmed that this peninsula surrounded by warmer oceans has also warmed itself. The other three articles all refer to the same BAS press release about the "giant awakening". In their own article, the BAS concedes that it is "difficult at present to predict the contribution of Antarctica to sea level rise". So if one of the leading authorities about the state of the Antartic Ice shelves does not even know how changes in those ice shelves will affect global sea levels, then how can you tell us that what is happening in Antartica will cause sea levels to rise. Sounds like your in the wrong job, Fallout. I think some people at BAS would be very happy with your expertise. Fact: Measured sea levels have risen steadily for the last 100 years. Fact: More melt is occuring around the perimeter of the Greenland ice cap than is being redeposited in the center. Fact: Major ice shelves in the Antarctic have collapsed in the last 10 years. Playing what-if word games based on bits and pieces of data does not invalidate the greater trend no matter how much you might wish it were so. for those of you who like to wade through some numbers http://arctic.atmos.uiuc.edu/cryosphere/ has some up to date information, although it is more focused on sea ice, not land ice. Good point. Greenland is not the only problem, there are glaciers melting in Alaska and other places too. Your point on Antarctic and NZ ice increasing seems peverse. What about the Larsen B and C ice shleves. One collapsed dramatically last year in only a few days when the scientists thought it would last 100 years? I think the question of Antarctic ice is complicated. it snows little. An increase of snowfall is compatible with an increased warming combined with wet conditions to create storms. The real question is whether this is incompatible with overall global warming due to greenhouse effects. No, it isn't. With warmer temperatures you can have both more melting and more snowing. I do not believe that rise in sea level will be the dominant malevolent effect of anthropogenic climate change. That will happen much later, after rainfall patterns have changed sufficiently to disrupt massively much agriculture and the human societies which depend upon them. I plan to get to Antarctica, but this post was too long already, so another time. Sorry, Stuart, I intended my post to show up under DuncanK's "the ice is growing" post, but haven't quite gotten the hang of this forum's workings yet. The graph is from the Greenland Ice Sheet Project. Robert W. Felix has written a popular book, Not by Fire, but by Ice -- Discover What Killed the Dinosaurs... and Why it Could Soon Kill Us. In it, he suggests that natural forces periodically cause a weakened magnetic field around the Earth (as evidenced today by a shifting north magnetic pole). A weakened magnetic field leads to increased tectonic activity, since the plates are less tightly controlled by the magnetic field. In turn, this leads to increased volcanic activity, including on the ocean floor, which leads to increased global ocean temperatures and humidity. Noting that 10 inches of rain is equivalent to 100 inches of snow, he suggests that there is a tipping point where massive snowstorms occur, sending the Earth rapidly into glaciation. The first chart posted above seems to indicate that we are once again reaching a peak in temperatures, before a sudden, spectacular drop that could happen in our lifetimes. See Ice Age Now for more evidence of his theories, including lists of expanding ice sheets and record low temperatures. Since when are tectonic plates controlled by the magnetic field? The notion that the magnetic field of the earth "controls the tectonic plates" seems like total pseudoscience to me. I appreciate the debunking. I don't know what to believe sometimes. Perhaps I should have used the word "influenced" instead of "controlled" in my summary. "Let there be no doubt in your mind: rising land, mountain growth, volcanism, and magentic reversals are inextricably linked. Cores collected by the USNS Eltanin "show clearly" that peaks in volcanism occurred during reversals, said oceanographers James D. Kennett and N. D. Watkins. In 14 samples from eight different cores, only one did not show volcanism at a reversal. Mauritius, Rodriquez, and the Reunion Islands in the Indian Ocean all had volcanic activity at reversals. Do did Nunivak Island. Almost all tectonic movement can be linked to magnetic reversals. Seafloor spreading, sea level changes, mountain growth, earthquakes and volcanism all seem to speed up whenever the frequency of reversals speeds up, said Peter Vogt of the U.S. Naval Oceanographic Office." If this author is wrong, someone please tell me. I've got enough to worry about! There was an excellent "NOVA" episode on PBS not too terribly long ago that covered the theory of periodic magnetic reversals, and yes, peak volcanic activity coincided with the reversal itself. The theory also supposes that tectonic plate activity was mildly influenced by the magnetic reverals, because the underlying magma is generally somewhat magnetic, and a viscous liquid, so it's movements are somewhat influenced by magnetic activity). However, reversals only occur every 200,000 years or so, not 10,000, and do not necessarily coincide with ice ages (except as a possible result of the volcanism they tend to engender), despite what some would claim. And then I found Fallout's URLS above so will just add this one it to the mix. I would guess the causality is that both volcanism and the Earth's magnetic field share a common progenitor: dynamics of the interior magma. This doesn't mean that magnetic fields, by themselves, have any specific direct effect on volcanism or tectonic plates. I'm curious about how the magnetic field of the earth, or the sun, or any passing neutronium meteors, or whatever, could affect plate tectonics. The curietherm (where the internal temperature of the rock is higher than the curie point of the minerals and they stop being magnetic) isn't that far down. You might want to go to Ice Age Now and buy the guy's book. He goes into a lot of detail, both factual and theoretical, about electromagnetism, how it works in the sun and in the Earth, and interestingly, about how the magnetic charge of the galaxy might be affecting Earth as we pass back and forth through the galactic plane (between the galaxy's "north" and "south" regions) over time. Maybe the tectonic movements (or what ever causes them) control/influebce the magnetic field. The climatologists are pretty much all in agreement that the forcing that drives the earth in and out of ice ages is changes in the earths orbit that, while not changing the total amount of sunshine much, change it's seasonal and regional distribution significantly. Thanks Stuart. Understanding that ice ages correlate to Earth's orbit, and that they come in cycles, do we know when the next one is due? I've seen some reputable people point to a 100,000-thousand-year warming and sudden cooling cycle, with us today being at the very end of the warming cycle (completely independent of human activity). Perhaps magnetic reversals (and "excursions", which seem to be the ones happening every 11,000 years) are just indicators of orbital change, and not the cause of the glaciation periods themselves? BTW I've read somewhere that technically we're still in an ice age at the moment, and that actually what varies more frequently is "glaciation". I've also read (in Science magazine I believe) that if humans hadn't started agriculture relatively recently, that large parts of the earth would be covered in ice today. This is a current controversy. There's been some papers recently arguing that we would be starting the long slow slide towards the next glaciation if it wasn't for human climate interference due to agriculture over the last thousands of years. There's a great book Plows, Plagues, and Petroleum, by William Ruddiman, an eminent climate historian articulating his theory on this. However, other climatologists feel it's just that the peculiarities of the orbital shifts are making for a slightly longer inter-glacial. There's a recent debate on this at Real Climate. Speaking of magnetics, the magnetic north pole has moved 140 miles north and 480 miles west in just 4 years! The earth is wobbling more now, then who knows how long. (million years maybe). Whoops forgot we aren't in Kansas anymore, data a little different at the poles. More like 150 miles. Still a long ways though. This is not in serious dispute, Stuart. Our current interglacial resembles the one (Milankovitch variables) in MIS-11 around about 420/kya which lasted about 28 thousand years. The similarities between our current warm period and MIS 11 are primarily due to a similar configuration of the orbits of the Earth around the Sun: the relative positions of the Earth and Sun are thought to be the key driver of ice age cycles. "MIS 11 shows us that the climate system can indeed reside in a warm period for 20,000 or 30,000 years, something that we can't say based on the last three warm phases which are no longer than about 10,000 years each," said Stocker. See here reporting on the latest EPICA Antarctic ice core. 1) Solar forcing which is a function of the intensity of the sun and/or the position of the earth relative to the sun. 2) Anthropogenic Forcing due to GHG emissions consequent on human activity. My understanding is that the IPCC views solar forcing as not being a factor in recent climate change and has 90% confidence that human activity is the primary cause. We should get an update this Friday. And great article Stuart!! Thanks for turning your eye and digital pen to this topic. This is off-topic, I know, but I have to say it. I visited greenland last summer as a tourist. It was spectacular! I recommend it highly to anyone who loves wild scenery. My wife and I are considering going to Greenland in May. Besides the beauty, we are particularly interested in what Stuart is posting on. If you have any tips, mind emailing me at laurjohn at sbcglobal.net? The map of Greenland may be a little misleading. Is anyone aware of the National Geographic's map of the artic ocean floor? It shows an opening on the western shore of Greenland, from about 16-18 degrees N latitude,and about 25% of the north central interior surface of Greenland is well below sealevel. of course as far as ice-sheet melt goes this is a mute point. Further, I have as much respect for the IPCC report as I have for the credibility of CERA. They both have an agenda to fulfill. As for the evacuation of Vanuatu, please download the PDF file, Pacific Island Report. It is a scientific study by an Australian University & Australian Gov. It provides some interesting data on ocean rise. I'm not sure I understand. Are you really saying that because parts of the land mass of Greenland are below sea level, when the ice on top of it melts it will have no effect on sea level? That's flat out wrong. Most of the under-sea-level land is perhaps 200 meters submerged ... with 3000 meters of ice on top of it. Not exactly the way an iceberg would float. And it's ludicrous to think that that's not taken into account in estimations of sea level rises were the ice cap to completely melt. As for the link on Pacific Island sea levels ... well, it's true that local sea level is a lot noisier than we might expect. El Nino and other ocean effects (and even plate movements) still can easily overwhelm the global warming signal in a particular location. But the best evidence does support global sea level rise on the order of 2-3 mm/year (and increasing). The Vanuatu evacuation can't necessarily be laid at the feet of global warming. In 50 years it's likely things will be a lot clearer, sadly. Parts of Greenland's land surface is below sea level due to the weight of 3 km of ice above it. A relatively quick melting of the entire ice cap could allow the land to rise fast enough to upset regional tectonic equilibrium. By fast I mean on the order of centuries. Why are we supposed to care about whether the land surface of northern Greenland rises after its ice sheet melts? However, I believe that the sea level going up because the ice cap melt will have a stronger effect than any possible and not problable effect to the tectonic plates movement(well, for now I think there isn't any research paper making any correlation between deglatiation and earthquakes - or better, I don't remember have read any paper making that correlation). If the sea goes up more half meter it is enough to make the disaster at New Orleans a worse nightmare. And a nightmare that can happen all over the coast. I have read that the level of the Scandinavian countries has been rising ever since the last deglaciation. No tsunamis from there that I remember. Also, if I remember correctly, the Indian Ocean tsunami originated off the west coast of Sumatra -- not particularly close to Bali, unless I'm confused. And actually, everywhere "has tectonic plates." But it doesn't seem obvious that the reaction of plates to glaciation/deglaciation has big effects on seismic activity, which is what causes tsunamis. Stuart, another good post on energy and climate. The difference in speed of glaciers in winter and summer is called "surging" and has been documented now for more than a decade. There is great discussion in climate areas that higher temperatures (due to global warming?) causes more melt in the summer with a resultant greater water layer under the glacier. This water layer is between the ice and the bedrock and reduces friction allowing the entire sheet to move down hill, causing the surges. When I was in Alaska and northern Canada in the late 1980's it was obvious global warming was underway. ALL the glaciers I saw were thinner and had melted back from the base and sides of the mountains compared to the past. Anyone could just look at the ice mass and see that they were smaller than they used to be. I was completely convinced of global warming at that time. The data continues to reinforce a warmer planet, especially at higher latitudes, where most glaciers are found. The planet has a fever and humans are the problem. I had the same experience in the Sierra and Trinities here in California where the glaciers and snowfields tended to be smaller than the photos in the guidebooks. Does any one know if there has been a study on the correlation of the earth's temperature history, and the history of earth magnetic field flips, recorded in the molten lava boiling from the floor of the Atlantic ocean. As I understand it, there is a long history of the magnetic field flips. As you move away from the where the lava is escaping from ocean floor. The lava has solidified and locked in it's, then current, magnetic field history. "In 1967, Norbert Bonhommet and J. Babline discovered a reversal in lava flows at Laschamp and Olby, at Chaine des Puys (chain of volcanoes) in central France. Our magnetic field reversed itself about 20,000 to 30,000 years ago, they said, then remained reversed for about 10,000 years. They called it the Laschamp reversal. Is it just a coincidence, Bonhommet asked, that the return to normal corresponded with the end of an ice age? Though later research placed the Laschamp event at about 47,000 years ago, its discovery made us aware that other reversals might have occurred. And they have, many times. The most recent reversal, the Gothenburg excursion, occurred about 12,350 years ago (Morner and Lanser). During the excursion, magnetic intensity dropped dramatically, and magnetic inclination moved 180 degrees. It also fluctuated, making wild swings of up to 80 degrees (Kopper). Another excursion, the Mono Lake excursion, occurred about 23,000 years ago (Kukla, Berger, Lotti, and Brown). During the Mono Lake event, magnetic intensity fell ten times faster than normal (Liddicoat and Coe). Before that came the Lake Mungo excursion of about 33,500 years ago (Barbetti and Flude), and prior to that was the "real" Laschamp event of about 47,000 years ago, when magnetic intensity fell to less than 15% of today's. -- Source: Not by Fire But by Ice, Robert W. Felix. "That there is a link between magnetic reversals and ice ages is undeniable. Look at the record. Ice played a major role at almost every extinction in history. Climatic cooling was the "dominant agent" at the Cambrian extinction, said Steven M. Stanley of Johns Hopkins University, as it was at the Ordovician, the Permian, the Devonian, the Carboniferous, the mid-Miocene, and yet again at the end-Miocene. The end-Triassic, end-Jurassic, end-Silurian, and end-Eocene were times of glaciation, and four extinctions during the Cambrian can also be attributed to glaciation. The Precambrian extinction saw extensive glaciation, and so did the mammoths. And what did those glaciations have in common? The end-Carboniferous, end-Ordovician, end-Permian, end-Cambrian, and end-Triassic were times of frequent magnetic reversals or changes in polar wander, while the Cretaceous, Eocene, and Miocene actually end at or near magnetic reversals. At least 12 magnetic reversals can be linked to glaciation during the last three million years alone... If volcanism correlates with magnetic reversals, and if 80% of all volcanism occurs underwater (as NOAA says), underwater volcanism must go bonkers during magnetic reversals, pumping vast amounts of red-hot basalt at 2,150 F into the seas. Submarine volcanism. That's why sea levels rose so abruptly and the end-Eemian (and why they're about to do so again). That's what heated the waters that flooded Cape Flattery (in the Makah Indian legend). That's what heated the K-T seas and evaporated them. That's what heated the mammoths' seas and evaporated them. That's where the moisture comes from to cause glaciation. That's why ice ages correlate with magnetic reversals. And that's why the next ice age could begin any day." Given that it is from the British Geological Survey I would tend to believe it on first reading. They had no wood, because they cut all greenland trees. If they had no wood they had no ships. they never learn how to use hides to make boats with the natives. I skimmed a little bit to confirm my recollection. Apparently the Vikings arrived around AD 800, lived their for a few centuries, traded with other Viking nations, and died out by maybe 1300. I figure a few centuries of trade leaves open the possibility. It would be really interesting to know, in a Peak Oil sense, what happened when the last boats, and indeed the last boat, left. But certainly those who stayed through it all demonstrate the stubborness of human societies. The story is very fully covered in Jared Diamond's book "Collapse". I think I read about the first third of "collapse" before getting worn down. That guy writes great books, but they are not always a fast read. I'll probably return to it. I definitely got the take-away that the Europeans left technologies on the table, so to speak, as the natives continued on. It was workin' up to a point, they just didn't "gear down" as we might say today, in the face of changing circumstance. "I definitely got the take-away that the Europeans left technologies on the table, so to speak, as the natives continued on." No, the natives had its own thecnology, for example kayaks and iglus. J. Diamond book hint the fact the vikings at greenland never tryed adopt the natives thecnology, mostly because they were biased against non-christian and not-european cultures. IMHO, it is improblable some colonist returned to Iceland using a ship or boat, because there are no reference at the Sagas. And the sagas made reference to the last ship that get to greenland before the collapse. It is possible that some colonists survived between the natives, so we had some "legends" and folklore about white inuits. However, I think no genetic research found an inuit group that descend from europeans so far. Juan, buddy, which technologies do you think I meant when I said "the Europeans left technologies on the table" if not the native ones? Especially, when I said "so to speak, as the natives continued on." Maybe I should stop being subtle. As far as "improbable" ... my feeling is that the greenland has become a morality tale, and while such tales tell truths, they are never going to tell every detail. The story is, of course, about the die off, and not the ice reefs and increasing difficulty ships had in reaching Greenland. It is incomprehensible that someone speaking now, of a five century period of human history would insist that there was no, never, any passengers in the eastward direction. To me that is simply an irrational expectation. BTW, Icelandic records are good, but my family's only go back to the birth of Steinmodi Amasson in 1635, child of Ana Thorvardsson and Gra Hallsdottir. No concrete record exists if some girl in Greenland liked some sailor from Icleand prior to that date. Typing too fast while looking at a old printout ... "Ama Thorvardsson" and "Groa Hallsdottir"
That makes more sense when you think about the "sson" and "dottir"
Add 5 more meters of sea water rise to the 7 meters from melting Greenland, courtesy of the degrading Western Antartic Ice Sheet, and you end up with major cities like Maimi, Houston, New York, London, and Los Angeles all underwater. The snowy top of Mt. Killimanjaro, in Tanzania, has also receded dramatically in the last few decades, and will dissappear completely in another few years. I see a trend. One does not have to subscribe to a descriptive term like "global warming" to see that dramatic "climate change" is clearly underway. Stuart...the problem isn't with the data. The problem is with perception. Global Warming and Peak Oil are tools of the environmentalist. Turn on most any conservative AM radio station and listen to the diatribe: anti-liberal, anti-environment. At TOD I think the importance of social issues gets overlooked. The perception, I believe, is that Climate Change, Peak Oil, etc., are not issues, but liberal agendas, and for that reason for a lot of people, they are dismissed as such, not to be take seriously. That's what I find dangerous. Currently, science is considered a Liberal agenda! I agree with GilaMonster - legitimate scientific concerns about climate and fossil fuel resources have become politicized. Personally, I remain open to criticisms and debate (as we all should) but the proponderance of evidence is in support of both rapid climate change with a large degree of anthropological forcing and our concurrent planetary arrival at peak oil/gas. But who is taking the lead on the politicization? I think it is the Left. What I see here on TOD and elsewhere is that the Left wants to use these issues for taking political control of people's lives - raise taxes, redirect land use, constrain transportation choice, even depopulate! The voices of the advocates have a very poor reputation - academia is mired in political correctness, the bureaucracy is never to be trusted, the mainstream media have repeatedly lied and twisted the facts to suit their own agenda, the UN is a joke. I hear the Right responding but not very well. They often point to countravailing facts that need explanation but these are often poorly stated in public debate. They certainly are sensitive to the attempted power grab behind the issues. The answer is that both more can be done but less than some people want. We are going to have to find a middle ground, one where individuals through their own will and power reduce our carbon intensity. Harangues and governmental coercion and not going to work and will be resisted. Besides, life can sometimes get tough. The best plan is remaining strong, flexible, and dynamic so that we can handle whatever the Universe throws at us. I agree with your general point but not your argument. Too many scientific data bases, gathered painstakenly over time, subject to peer review, have been ignored or disputed by conservative rebublicans. Data is data and should be studied carefully. Conclusions drawn from the data may be in dispute but don't make policy by ignoring valid data sets. Specifically global warming falls in this category. Initial data sets from the 1970's and early 1980's indicated the climate was warming. Hypotheses were floated to explain this. Some of these were linked to CO2 level data sets that absolutely showed increases since before 1950. An overall hypothesis was put together to test. Leading to ice cores, ocean temperature, glacier studies. There is little dispute (in the political arena) that global temperature is warmer now than 1900-1950. This was not the case in 1985. It has taken two decades to be extremely statistically confident the world is warmer, as previously stated. But all of a sudden the debate is not about IF it is warmer or not but WHY. Now that there is no dispute that it is warmer, thereby supporting the various global warming models, the debate is what is causing it and the conservate viewpoint is that it is probably just a natural fluctuation, nothing to worry about. So scientists are trying to link (or dispute using a null hypothesis) that the change we see is unprecedented in global history. This would again implicate humans as causal agents if true. We are now many decades into studying climate shift and still most conservative Republicans refuse to use the KISS test. KEEP IT SIMPLE STUPID. The simplest model that fits the data is usually most accurate. I see an unwillingness by many conservatives to accept that man can impact the earth in such profound (and often negative) ways. That is the problem. Negative human causalities does not jive with the conservative (and especially religious right) world view, that the world was created to be our provider and plaything, and anything we do here on Earth is fine well and good so long as it lines our pockets and makes us happy. Deliberate ignorance of the facts is their answer, because those same facts are unpleasant to face and would require behavioral change. Immature children exhibit similar behaviors, when faced with the unpleasant. A predisposition to doubt proclamations of sudden changes in the way things work is a defining characteristic of a "conservative." I share that general tendency based on long experience and a through reading of history and human sociobiology. "Cooler heads" need to prevail more often than not! I think that many in the conservative camp are willing to entertain that the recent climate (200+ years) has indeed shown a warming trend. The weakest links in the Kyoto justification are that fossil fuel burning and land use changes are the predominant causitive factor and that a sudden deacceleration in GHG emissions will prevent further changes. From general physics principles, one can argue that at some point CO2 would warm the planet but is it 1000 ppm, 500 ppm, 300? Worst, the Kyoto negotiators showed themselves profoundly UNSERIOUS by excluding nuclear power as a creditable replacement. With that single proviso, they completely blew their credibility. Giving China and India passes did not help either. The problem conservative don't want to face is what to do with the trillions of dollars if capital goods tied to fossil fuel extraction and internal combustion engined vehicle manufacturing. All capital investment has an anticipated useful life. Capitalism is good at "Creative Destruction" - it is one of its virtues! Detroit can retool, coal power plants can be scrapped. Even those bankrupted Calpine natural gas fueled combined cycle power plants will either get scrapped or used for some other purpose. The men and machines who built the natural gas-fueled gas turbines will make helium gas turbines for pebble bed reactors. What happened to all those horse stables and carriage makers? The problem comes from change too rapid where the capital investments either haven't been amortized, can't be retooled, or the replacements don't offer sufficient returns. Our gas stations will be converted to hydrogen dispensing stations (maybe). People only make real profits on change, not on statis. i live in the middle of a red as red can be state. i don't think that many people here, outside of the minority in towns,care the slightest about global warming or climate change. it's just totally off their radar sceen. now, the cost of gas in their tank or if there is gas in their tank...that's another thing...their opinion, "polar ice shelf, who cares?" But why shouldn't these issues be "politicized"? If the science we have is right, then we have very, very serious problems to face, and they can only be faced by very, very, serious political action. A "middle ground"? Between what and what? What exactly makes you think that anything less than "government coercion" -- aka political action -- has the slightest chance of ameliorating the situation. "Life can sometimes get tough"? "The best plan is to remain strong, flexible and dynamic . . ."? This is just euphemism for "The Market will provide," isn't it? I think in our system the left arguing for an extreme position rather than seeking "middle ground" promotes the status quo. You scream out about the massive changes that we need now and are marginalized as "left wing wacos". This leads people to associate the cause be it global warming or peak oil as a waco issue. If instead you argue the compromise case with a well recognized strong scientific position you seem reasonable. Given some time those on the far right arguing against the very existance of GW or PO will fall into the waco category. The facts that need facing are that a free populace without socialist government command will largely be conservative and slow to change. Looking at the politics of Global Warming in America you can see the change working through the system. Translating the slow change in attitude to change in behavior with real negative impacts will be the real test of heart. What are you arguing for? A dictatorship? If so, just say so. It's too bad, though, that the last time the world experimented with dictatorships based on scientific socialism we ended up with the greatest environmental disasters in history: the Aral Sea, Chernobyl, Three Gorges Dam, and so on. Why must you jump to extremes? Democracy is a form of government, and capitalism is an economic system. If the people's elected representatives vote to set up national programs to help the country deal with coming energy problems, how is this a dictatorship? There is a difference between those of us who think the market will provide, and those of us who don't. But the government is well within its power to set up things like highway and rail systems, and would also be capable of getting involved with energy infrastructure, without becoming a dictatorship. I was merely asking SqueakyRat whether by "government coercion" he meant a dictatorship. Dictatorship is not necessarily inconsistent with democracy. It was fear of the "tyranny of the majority" that led the U.S. Founding Fathers to write a consititution based on separation of powers. If the looming crisis is so grave that SqueakyRat and others want to institute something akin to a dictatorship, then just say so and we can discuss the pros and cons. If I have misunderstood what SqueakyRay means by "government coercion" then I would appreciate some clarification. No, I don't mean a dictatorship. I mean a policy, democratically agreed to, that will emplace the incentives that will get us to the kind of large-scale social and economic behavior that our best science is telling us we need if we are to avoid catastrophe. I just don't get the libertarian take on this stuff. And by the way, yes, this will mean coercion: taxes, distortion of markets, regulation and its enforcement, and so on. This is what government is for, and only its abuse is objectionable. Show me some other way, if you like, but don't just prattle about "dictatorship." Thank you for clarifying. One of the unfortunate things about this means of communication is that one can appear rude inadvertantly. Thus, I am sure your use of "prattle" wasn't meant to be rude. Also, thanks Twilight. I exactly agree. First time posting here at TOD. Stuart, nice work, as usual. 1) the reduction in sea ice seen in the Arctic means less reflection of sunlight back into space and more energy absorbed by the (relatively dark) ocean. 2) The melting of the permafrost in the Arctic causes the peat bogs to dissolve. There is a prodigious amount (don't have any stats handy, sorry) of carbon stored in these peat bogs. 3) Changes in cloud cover, which scientists originally thought would be a negative feedback (more warming = more clouds = more reflected sunlight = less warming), may not help and may actually accelerate warming. 4) There is a huge amount of methane (a super powerful greenhouse gas - an order of magnitude worse than CO2) stored in the clathrates in the ocean. If that methane were to be released into the atmosphere, warming would take off. So, global warming seems to be self-reinforcing rather than self-correcting. I want to be clear - I'm not a climatologist, and I would welcome anyone who could elaborate on these points or explain why I'm incorrect. But there is a real possibility that we've already passed a tipping point where climate change is out of our contro, or may reach that point very soon. As Stuart pointed out, we've got another 1/2 a degree or so of warming to look forward to even if we stopped burning all fossil fuels tomorrow. so the surface will cool. Stuart, did you have a look at Recent Ice-Sheet Growth in the Interior of Greenland? Just published in Science in October. A continuous data set of Greenland Ice Sheet altimeter height from European Remote Sensing satellites (ERS-1 and ERS-2), 1992 to 2003, has been analyzed. An increase of 6.4 ± 0.2 centimeters per year (cm/year) is found in the vast interior areas above 1500 meters, in contrast to previous reports of high-elevation balance. Below 1500 meters, the elevation-change rate is -2.0 ± 0.9 cm/year, in qualitative agreement with reported thinning in the ice-sheet margins. Averaged over the study area, the increase is 5.4 ± 0.2 cm/year, or ~60 cm over 11 years, or ~54 cm when corrected for isostatic uplift. Winter elevation changes are shown to be linked to the North Atlantic Oscillation. I didn't see a reference to it in you post. I was aware of data showing the amount of snowfall is increasing but hadn't read the reference you mention. My understanding is it's both expected (more snowfall due to more warmer (by Greenland standards) moisture laden air getting up there), and not enough to offset what's (apparently) happening with the ice dynamics. But all these results are very preliminary, and I'm sure the situation could change as the science settles down and becomes clearer. The climatologists are now focussing a lot of effort on trying to understand what's happening with Greenland and the WAIS. This pattern of change is not stable. You will not get the interior patches that are experiencing growth currently surrounded by ice free regions and somehow carrying enough ice mass to offset the losses. The currently growing patches will be prone to disruption by lack of buttressing and warming in the interior in regions of ice loss. The picture you post points to transient growth effects that will be overwhelmed in the long run, the overall pattern is that of a collapsing ice sheet. Looking at all the red in Louisiana makes me wonder what the hell are they thinking when they propose spending $200 billion to rebuild New Orleans. Because nobody in control of that money thinks the sea levels will rise in the future. Besides, the IPCC stated that sea level changes would be driven by bulk water temperature and thermal expansion. That put rising oceans out a hundred years or so. They discounted ice sheet melting, if memory serves. I also think that Bush has quietly retreated from that offer. The country (not necessarily the government) will continue to make large investments in the area, if only for transportation needs and oil and gas exploitation and refining. The area remains important to the national economy if only due to natural resources and its location. Oh, it's even worse than you think for New Orleans. Try to find a map of the continental shelf in that area. For most of the cost, the shelf extends outward from the oceanfront areas by dozens of miles. But New Orleans is literally sitting at the edge of the shelf. If you drained away the water, New Orleans would be sitting on the edge of a 2 mile high cliff. And to make it more fun, the entire landmass is sliding off that cliff at a steady rate. Even if we rebuild New Orleans, save it from the global sea rise of the next century, in a few hundred years it falls to the bottom of the Gulf of Mexico anyway. Really brilliant investment strategy there in a time of tightening resources, eh? Total & Complete BS !! The "slide" is at the rate of thickness of two credit cards/year, far less than a meter/century. And New Orleans is quite some distance from even moderately deep water. New Orleans has an asset lacking in New York City, Washington DC, Miami, Boston or any other US coastal city. MASSIVE sediments deposited by the Mississippi River, enough to build up thousands of square miles meters deep in a century. All that is needed is a gate in the "channelized" Mississippi River to let high spring water flood into marshes. Relatively low cost, low energy means of raising the surrounding swamps as sea level rises. Alone among the US coastal cities, New Orleans can survive rising sea levels. Today, Rotterdam is over 7 m below sea level and functions well and safely (since they had Dutch engineers and not incompetent US Army Corps of Engineers). And only New Orleans, New York City and San Francisco have such cultural value that they are worth saving for that reason alone. PS: Trying to move New Orleans would destroy it. All that would survive would be a typical plastic American "city" of no interest or value. They probably aren't thinking, but New Orleans is something of a conundrum. As long as there is civilization on North America, there's going to be a port at the mouth of Mississippi River. That port will need a city to service it. The real question is how to build the city we need there, not the city that we remember there. Because no-one thought till quite recently that there was much near-term risk of sea-level rise's of this magnitude. Now it's become uncertain again. dp1: No I am not saying that at all. I am saying that the western Greenland coast shows a real shoreline where there is no island surface, it is only an Ice shore line, and with the height of snow build on central Greenland, the build is resting on the ocean floor. What I am saying is that the Pacific Island Report, if it is accurate and I believe it is, shows no discernable rise in sea level between 1993 and 2003. So why would there be an evacuation? The data may have been updated since I read it In January. That was my point (global average sea level increase is well supported). But to be fair, dipchip is correct in the specifics; over 20+ years there hasn't been a statistically observable sea level rise on Vanuatu in particular. Local sea level data is noisy, as I mentioned. The Vanuatu evacuation was in the wake of flooding as a result of a storm. There has been a sense that this flooding has gotten more frequent, and the village decided it was time to leave. Can't blame them given what's coming with increased sea levels and quite possibly increased storm intensity. So, Stuart, as you are the master of graphs, what can you tell us about the graph above. It certainly is an interesting one. To me it shows a very steady (linear) increase in the average sea level over the past century. how does this match up with the more recent increases in CO2? What were sea-levels like back in the so-called medieval warm period when temperatures were warmer than today? Posting this information is very interesting, but it is one little snippet of data about a world which is very, very, very complex. Who knows how all these systems are related, and whether we can influence them or not. Every day millions of tonnes of water are literally sucked up out of the oceans into the atmosphere to form clouds. Is this process going to slow down with Global warming? Maybe it will increase! Maybe the extra clouds will reflect more sunlight away from the earth. Maybe, maybe, maybe! If we are indeed coming out of an ice age as someone else posted, then this steady increase in sea-level may just be the result of that thousand year long process. Who knows? I certainly don't, and I doubt anyone here does either. My concern here is that, in contrast to Peak Oil, there are hundreds of thousands of scientists debating, publishing and campaigning wrt Global Warming. World leaders are debating it. A whole international organisation (of beauraucrats) has been set up to address it (the IPCC). Global warming does not need our voices of protest. PEAK OIL DOES! Let's not get pulled away from our most important goal: Raising Peak Oil awareness. The rate and magnitude of sea level rise is not uniform over the globe but varies from one ocean basin to the next, reflecting variations in ocean heating and the way in which ocean currents redistribute the heat and water. It's also affected by plate tectonics and isostatic rebound - a geological process in which the earth's surface rises as stresses imposed by the weight of ice during the last glacial period are gradually released. Some parts of the Pacific coast are actually experiencing static or falling sea level because of these two phenomena. Recently I was designing the cooling water intake structure for a proposed Finnish nuclear power plant. It would pump water out of the Baltic Sea to cool the plant. I calculated that I had to conservatively allow for a 1 meter FALL in sea level (or rise in plant foundation) over the life of the plant (60 years). This was due to plate rebound from the last Ice Age. I had to conservatively allow for a 1 meter FALL in sea level (or rise in plant foundation) over the life of the plant (60 years). I was aware of isostatic rebound but not aware that it was that significant, or rapid. Begs the question of what happens if Greenland were to rise 1 meter in 60 years. That would further displace seawater and result in incremental sea level rise in addition to any rise due to glacial melt. Indeed it is fascinating. In Scandinavia it is so rapid that it has long been noticed by the more inquiring minds. Anders Celcius initiated the carving of several markings in rocks at different locations in Sweden to investigate wether the sea was receding or the land was rising. Based on this it was concluded as early as 1765 that the land was rising unevenly, and the water was not disappearing. This page has a map showing the phenomenon. The scale suggests the highest values are about 7-8 mm/year. I have earlier seen maps putting the place with the highest values a lot further north and with higher values, but I was unable to locate them using google and norwegian/swedish words. In order for isostatic equilibrium to be achieved, Hudson Bay still needs to rebound as much as 150 m.
If Hudson Bay were to rise 150 m it would empty. Does anyone have information on potential relationship between the region of Hudson Bay, Greenland, Northern Sweden? Will deglaciation of Greenland promote or accelerate rebound? Will this deglaciation affect rebound in adjacent areas? What is the projected sealevel rise as seawater is displaced by rebounding land mass? Is there a collorary impact? Will increased weight of water on low lying Florida regions accelerate submergence of the associated region? Jaha - the map shows a circular "hot spot." It looks like this is independent of plate tectonics. Do you know the arrangement of tectonic plates in the Sweden/Norway/Greenland area? The "hot spot" is where the ice was thickest, where the land was pushed furthest down, and where it has the furthest to go before it has reached equillibrium. Scandinavia is on the Eurasian plate, greenland on the North American plate. The boundary is the midatlantic ridge, wich Iceland straddles. (there's also a mantle plume under Iceland IIRC, wich together with the volcanic activity from the plate boundary is the reason for the island's existence.) This is a bridge going from one plate to the other in Iceland :) The wikipedia article on plate tectonics has a map of the plates. The rebound of the crust won't be very fast, 150 m would probably take between 15.000-150.000 years with 1-10mm/year rise. If the isostatic rebound eaquals the rate of global sealevel change the local sealevel would be constant. If Greenland was to lose it's entire icesheet I imagine that would interfere with the rebound in the rest of North America in one way or the other. One thing to keep in mind is that the rebound works both ways: in northern Germany, southern denmark, and southern England, The Netherlands and other places the rebound is currently inwards but at a much smaller rate 1mm/year appr. The huge mass of Ice in scandinavia made the crust bulge around the icesheet, the bulge is sinking in the same way the depressed areas are rising. I have walked in the rift further north @ Thingvellir where the world's first representative democracy, the Althingi, was created. Noble, democratic Independent Iceland before the evil Norwegians made Iceland a colony, which later ended in the hands of the almost as evil Danes (who still have not given back all of the Sagas that they stole). Best Hopes for Icelandic Independence and Recovery of their stolen Sagas. The tradition of holding yearly local things to settle disputes and come up with new lawes ended in Norway in the middle of the 16th century I believe, when the king in Copenhagen grew to powerfull and was able to project his power down to the grassroot level even in far away Norway. At present, the parliament of Norway is called the Storting, (great ting) and the Danish parliament is the Folketing (people's ting), influenced by the saga's tales of the Icelandic allthing no doubt. Another Icelandic achievement regarding democracy was the election of the world's first female president, Vigdis Finnbogadottir, serving from 1980 to 1996. Deleted as was posted to wrong item. The Maldives, an archipelago of low sandy islands in the Indian ocean, is in a similar situation to that which faced those on Vanuatu. The island chain is only 1-2 meters above sea level at its highest point, and has been literally falling into the ocean over the last couple of decades. Up to 360,000 people may eventually need evacuating, as the entire nation, with its 5000 year history of human occupation, is subsumed by the sea. Here's some more information about the Greenland Ice Sheet I gathered earlier this year and last year. I should also mention the work of Gregory et. al (Nature 428, 616 (8 April 2004) Threatened loss of the Greenland ice-sheet which is summarized in this New Scientist article entitled "Greenland ice cap 'doomed to meltdown'". Another article of interest along these lines is The Role of Sea Level Rise and the Greenland Ice Sheet in Dangerous Climate Change and Issues of Climate Stabilisation (pdf). In general, I'd like to point out that global sea level rise (GSLR) is due not only to melting ice but also thermal expansion of the oceans as they warm. Finally, if any of you run across information from TechCentralStation about these topics, you may safely ignore it. Stuart: Nice graph of sea level rise of the past century. Shows a very steady increase in sea level. To put it in better perspective for many folks 18 cm or 180 mm is about 7 inches, so the oceans have been rising at a rate of 7 inches per century. Historical data shows 7 inch rise per century, quite ordinary, many centuries into the past. Until the aussies can show a discernable increase in the slope to the trend, my boys and grand kids will keep floundering & fishing the sand bars in Galveston bay. BTW the folks that have been talking about New Orleans sliding into the gulf, need to look at a fishing map of the Gulf. N. O. is more than 100 miles from the edge of the continental shelf, also Mobile & Pensacola. They must have been reading FTW. If you want to study global warming go to Real Climate-Climate Science web site, if you want to study PO go to TOD. To survive in this world in the future, you will need to be a person that others go to for advice. If other folks don't consider you useful for their survival. You may not. It should be said more often that the danger lies not in globally averaged annual changes but in increased variability, the extent and frequency of extremes, and seasonal differences. The cumulative probability distribution for temperature is shifting towards hotter summers. Where I live on the West coast, the overnight lows are increasing faster than the daytime highs, leading to a narrower diurnal temperature range. Hot extremes under the present climate become more common and new extremes are set. Cold extremes become less frequent. The risk of coastal flooding is greatest on a high tide accompanied by a strong storm surge. There's growing evidence for increasing frequency and intensity of storms in the northern hemisphere. Such events are of critical importance to human, plant and animal populations, whose health and distribution are affected by extremes more than by averages. a) If Stuart ran for President (Or Prime Minister) I would vote for him! The carbon intensity for coal is 56.9 lb-C/MBTU, for oil 47.2, and for nat gas 31.9. As you can see the stored carbon in coal is IMMENSE and very relevant to the solutions we come up with to peak oil. Incidentally, I wrote a paper on using forests for home heating for the US, and if we extrapolate the US forests as a % of global forest (10%), then we have 1,400 Quads left in forest stock (were we to burn every tree on the planet). None of this includes tar sands, NGL, etc. Fry, or starve, is that the question? Just to add to your points, Chevron has been advertising that we went through the first trillion bbls in 140 years and expects us to go through the next trillion in 30 years. If the first period of consumption results in this much grief what will occur when we make an equal CO2 injection in one quarter of that first period timeframe. Note that we are moving toward an environment where we will be adding ethanol derived CO2 to the FF derived CO2. In spite of evidence of a GHG problem we are acting to increase the CO2 loading. Excellent post Stuart, thanks to you and others who've contributed. Most of the articles I might have linked have been covered already, all I'll add to the Greenland ice sheet melting is: every new bit of news that comes along (that I've seen) makes the rate of melt seem to be faster than previously thought. The same seems to be mostly so for the West Antarctic ice sheet and many other glacial areas, too. The North Polar ice sheet is a geologically rare occurance and largely dependent on the continental configuration enclosing the Arctic sea. If it were to melt it would take a fairly extreme cooling for it to reform. No doubt the impact on ocean currents and climate (of it melting) would be profound. These changes, if they occured, would take many decades, probably several centuries. But we have no real way of knowing for sure when the tipping point might occur; it is feasible, but hopefully highly unlikely, we have passed some tipping points already. If they were to melt I venture that the rise in sea level will probably be a mild inconvenience compared with the consequent massive changes in climate patterns. One possibility that does scare me is large scale tundra thawing and the probable consequent release of large quantities of methane (mentioned by zeroworker7), a very potent greenhouse gas, as well as carbon dioxide. This could be a very rapid positive feedback process, if it starts and has the impact some fear there would be no stopping it and the effect could be quite abrupt. What we are coming to know about past climate changes is: fast, discontinuous, change seems to be the rule rather than the exception. we have: "Permafrost melt in our study area is associated with 1.6- and 30-fold increases in CO2 and CH4 emissions, respectively." Agric - I share your concern with regard to methane release due permafrost warming. Note that all soils store carbon. Increased temperatures will increase soil biotic activity and this will result in CO2 and methane generation that will dwarf human output. If there is evidence of this is found then we are in a runaway situation. I think that only inorganic sequestration can be considered a long term carbon sink. Also a decent percentage of carbon sunk in the ocean is pretty safe to consider out of the cycle say 50%. This assumes a higher chance of major forest fires if the climate becomes unstable. I just think that over time we will find that in a warming climate few land based plants are real carbon sinks but instead increased methane production and soil activity along with major forest fires may actually result in land plants being a positive short term term if methane heating vs C02 is measured. Also increased H20 respiration in the atmosphere in tropical regions would enhance greenhouse conditions. We will see but over time but tropical and sub tropical climates may be capable of increasing global temperature. It makes sense if you think about it that plants would tend to overall cause the conditions that enhance their survival if conditions are favorable. We are finding that large ecosystems generally cause at least regional changes that encourage the ecosystem to expand. It makes sense that overall tropical rainforest's will induce tropical rain forest conditions in nearby regions including rising temperatures through actually being carbon sources if temperatures are initially increasing for other reasons. I just think that all ecosystems are in a sense feedback positive such that they produce the environment favorable for their existence. Its easy to see that they can't be negative or the ecosystem will wipe itself out. Slightly to strongly positive when conditions prime the cycle makes sense in a eco-Darwinian sense. On a serious note I'm sure the ocean biosystems have the same positive feedbacks so a human induced warming trend probably triggers all kinds of ecosystems that prefer warmer weather to expand and induce warmer conditions. Of course this reverse is true in that reasonably long term cooling will trigger bio systems that like cooler weather to expand inducing further cooling. And we do know that in general temperate forests are carbon sinks so they probably tend to cause a increase in temperate conditions once a cooling trend starts allowing advancement. These trends are only blocked by the base solar warming load and intrinsic balance between competing ecosystems. This in a sense explains the distinctive often rich buffer zones between the various major climate zones. Such as subtropical regions and alpine tree-line boundary areas. These "buffer" micro climates act to slow and stop the expanse of the major climate regions along of course with basic solar balance. We know for a fact that mankind can readily disrupt this process in favor of desert like climate conditions. I'm becoming convinced that ecosystems probably have fair control of the worlds climate with geologic changes simply inducing various trends such as cooling and warming by initiation of positive bio feedback loops by the favored ecosystem. configuration till the next trigger starts a new cycle. No ecoystem can induce climate changes negative to its existence thats pretty obvious. The ability to be positive when conditions warrant seems like common sense. Even ones that cause cooling or warming would result in a overall larger area covered by the ecosystem even if some of the original region was lost to secondary feedback caused by say glaciation or desertification induced by the warming/cooling trend. The secondary cycle would still have a positive feedback on the overall climate. Sure their is a limit but the assertion the large ecosystems cause changes in the atmospheric greenhouse gas concentration to favor the ecosystems seems pretty reasonable. If I'm correct we probably started the earth on a warming trend a long time ago when we first became populous enough to have a significant effect on the carbon cycle. It is a natural cycle but it looks like we have probably whacked a far bigger hornet nest than we realize. Enjoyed your post as ususal Stuart, thank you. As to the numerous comments made above: It always amuses me to see how far removed as a civilisation premised on fossil fuel technology we have become from the three basic human needs of water/food, shelter and some positive social life. Climate change is already massively affecting the availability of food and water for large parts of the world population. Food production of any kind is utterly dependend on predictable weather and rainfall patterns. Climate change is effecting high flux systems like the atmosphere/weather long before and to a much higher degree than it forces longer term changes in the ocean/ice sinks/stores which I would call the brakes of the faster changing systems. As utterly necessary as it is let's just look at what we are doing here: Instead of looking at the speedo to find out how wrecklessly fast we are driving our hummers into oblivion we are carefully measuring the wear on the breaks to assess any future dangers and avoid looking out the front window. Some of you dismiss rapid and devastating changes to local climate patterns as localised and irrelevant. Local weather is what destroys crops we eat. Rainfall pattern change is what is destroying whole national crops already. The disappearance of glaciers will wipe out the water supply of 2 billion people. I am afaid a lot of humanity will not see the last of Greenlands ice sheet melting before a climate thrown into chaos has wiped us out within a few years through hunger and thirst and a total breakdown of social cohesion triggered by it. Farmers used to and (still do) watch the local weather at crop critical times (most of the year) with bated breath and high emotional and financial investment. We dismiss their concerns about failing weatherpatterns worldwide at our own peril. And to come back to peak oil which this forum is one of the most informed about: We are literally loosing the brute energy to mitigate any of these changes already happening now. Local crop failures are and will be increasingly catastrophic if we cannot move food around easily with ever higher oil prices. I am deeply scared seeing micro and macro climate patterns disintegrate around me and with it all safety of regional food and water supply. We can only be oblivious to this as long as we can fill our supermarket shelves with produce coming from one of the increasingly rare global regions that has escaped the worse of climate change in that particular growing season. Before looking at the loss of cubic km of ice we should be looking at the global loss of global grain crop stats - they are bad news, especially on a per head basis. That will affect all of us in 2006. (Again I am all for the climate change research but please keep your eyes on the windscreen while driving - and since you have access to the technology to read this I assume you are part of the few percent of the world population who are driving consumption/civilisation). Following are some remarks for those who argue that Greenland and Antarctica will remain in "total ice-volume balance" i.e., that the growing observable Antarctica precipitation will compensate for the loss of ice volume in Greenland. (1) Global warming models do predict that warming will increase precipitation over the interior of Antarctica, which until now has been an ice desert. (2) Consequently, we may initially see growing ice within the interior of Antarctica as the planet warms, not necessarily at its perimeter. Duncan and similar deniers of global warming: Note that global warming models do predict increase in Antarctic snowfall. Volcanoes release more than 130 million tonnes of CO2 into the atmosphere every year". Are we going to shut down all the volcanoes, too? Maybe the countries with more volcanoes will have to pay more carbon taxes? We'll be really screwed if we reduce our CO2 emissions and then we get some extinct volcanoes starting up! Volcanic eruptions and metamorphism release gases into the atmosphere. These gases include water vapor, carbon dioxide and sulfur dioxide. The carbon dioxide released is roughly equal to the amount removed by silicate weathering; so the two processes, which are the chemical reverse of each other, sum to roughly zero, and do not affect the level of atmospheric carbon dioxide on time scales of less than about 100,000 yr.
Talk about cherry picking of ‘facts’. Where is the cherry picking? The anthropogenic CO2 is *changing* an *existing* equilibrium. There has not been anomalous volcanic activity in the last 200 years or recorded history for that matter. The volcanic record can be tracked in sedimentary rocks. Volcanoes emit just 1% of the amount of CO2 pumped out by human activity, which stands at about 22 billion tons per year. It is interesting how every joe blow feels they are some sort of expert on global warming. They claim to know all the failings of GCMs and know better the subject matter they have never studied than full time scientists. Do you care to comment on aerospace engineering? Tell us what the engineers are doing wrong and how they should really be doing it. From prof Kerry Emmanuel of MIT, in a paper that supports the anthropogenic global warming hypothis. "As long as we continue to elect scientific illiterates like James Inhofe, who believes global warming to be a hoax, we will lack the ability to engage in intelligent debate. Scientists are most effective when they provide sound, impartial advice, but their reputation for impartiality is severely compromised by the shocking lack of political diversity among American academics, who suffer from the kind of group-think that develops in cloistered cultures. Until this profound and well documented intellectual homogeneity changes, scientists will be suspected of constituting a leftist think tank." The posters who reflexively accuse sceptics of spreading lies for Exxon are not helping the situation. This is nonsense. Do you think all those Russian scientists during the cold war shared an ideology with American scientists? Do you think the Nazi scientists shared an ideology with any other scientists? How about current Chinese scientists? Or Saddham's scientists? The above quote belongs to the same bad think as the "war on terror." Terrorism is a strategy to be employed in a conflict; it is not an enemy. The US can never win a "war on terror" because it simply does not comprehend what it is that it is trying to achieve. In engaging in a "war on terror" America does nothing more then demonstrate that it is a morally and intellectually bankrupt rogue state. You quote does nothing more then further support this argument. The author of your quote does not understand science. Science is a method for coming to an understanding. It may be practiced by persons with different ideological and religious beliefs. They argue a lot. Emmanuel of MIT needs to obtain a better command of English if he wants to avoid painting himself as an idiot. Their reputation for impartiality is severely compromised by the shocking lack of political diversity among American politicians, who suffer from the kind of group-think that develops in cloistered cultures. That is the real problem in the US. You keep electing the same people to office. Same social class, same schools, same secret Yale society, same family. America's political class makes the Ancien Regieme look like a discordant rabble. Roll the tubrils! "We've seen a 5km retreat of the terminus, we've see an almost 300% acceleration in the flow speed ... all occurring in the last one or so years," said Dr Gordon Hamilton, of the Climate Change Institute at the University of Maine. I was fortunate recently to see a presentation by this team of work they'd been doing in Greenland, just before they went off to Antarctica. The pictures showing huge rivers of crushed ice - miles across - racing into the ocean were beyond sobering. There might be a qualitative difference between our current anthropogenically driven warming cycle and those of the past, because of the release of fossil carbon. I hope someone can verify or disabuse the following that I read someplace, about how the massive coal beds that were laid down in the Carboniferous era could only be sequestered in such quantity because there was no competition from microorganisms. That is, bacteria had not yet developed the ability to metabolize cellulose, so any plant matter that died and was buried was pretty much destined to become coal or oil. Now, of course, there are both aerobic and anaerobic bugs that can digest cellulose, which prevents a lot of dead organic matter from hanging around long enough to be sequestered. And since there's no way to "unteach" those bacteria, there's no prospect of our Earth getting those huge ancient stores of carbon back underground, at least not via the route she used in the past. Is this true? Anybody? some are saying we can biosequester carbon by burying the charcoal generated in biomass gasification processes; if you will a Carboniferous Era Mk II. I don't know if anybody has thought about this problem deeply enough in view of other things going on. It seems to me as inert carbon is retired the shrinking amount of biologically active (labile) carbon will have to turn over quicker and quicker. There must be some limit or vulnerability to this and my guess is that it comes back to post Peak population. The more urgent problem to deal with is that you need extremely cheap energy, close to free, before people will be willing to simply bury such an excellent energy source as charcoal. Perhaps in 50 years' time, when fusion is up and running (yeah right), but the earth is rushing towards a Venus-like greenhouse state, this will look like a good option. It would be a good way of restoring soil fertility too. One of the most high leverage solutions I read is to make the insurance companies and mortgage companies aware of the risks of flood damage in the next teens of years. If the risks of shore flooding are great enough no mortgages will be financiable. One would expect development of Florida swamp land to stop. Once we see finanicial firms relocate to the upper Hudson from Manhattan to avoid insurance costs this will be another signal. Insurance companies should make it clear the risk factors in locating to elevations less than 7m above sea level. This is already taking place. Insurers are increasing the deductible (to $100,000 plus) or are refusing to ensure coastal zones or other risk areas. Ummm... anyone else notice that most of this thread is from Dec. 2005? Just thought I'd point that out. I had a note on this "re-post" earlier today that it was from Dec '05, but I took it down. Still pretty germane, especially with the ten year warning out today. PG - Thanks for reposting it. Stuarts work is really great. Don't know how I missed this the first time around. PG, why did you take down the note on the re-post? Clearly noting when an item is a re-post reduces confusion for everyone. I could be case of editors sacrificing a little integrity in order to draw more eyes. Not very cool, in my view. Massive methane releases in the arctic? Has anyone here seen the arctic? A collective one time fart by all members of TOD could create more methane. The globe's significant methane deposits are under 400' of ocean. We keep it there to turn off the ice ages every 175k years. This week the IPCC releases the first of four reports as i mentioned last month. It is the fourth report by the UN in two decades. It is my dear hope that some of the idiots here at TOD read it. It is obvious from the comments today that only about five members know a tad about climate change. I liked the Guardian comment today. "One report states that 50% of species will be lost due to climate change within 30 years". The Guardian doesn't talk about the 6 reports that show it to be flawed balderdash with definitions meant to mislead. Science is like that. Some good studies. Lotsa bad ones. And unfortunately the junk science is gobbled up by many TOD types that are looking for bad news. The idiots. We all know who they are. IPCC AR3 2001 was an awesome document. Some parts hijacked by the politcial factions, but well done none-the-less. AR4 will show us over the next nine months what the truth is. What they know. And what they don't know. And fortunately, it may be frank this time about what are the myths. Like the idiocy of an Atlantic conveyor slow down. Stuart, thanx for some of your links. I've read enuf abstracts to reach my yingyang but i always appreciate missed ones. It is sad that most of the posts reflect that the authors did not read your whole essay or even take a moment to digest its graphs. I know that we have found a number of lakes under the ice in Antarctica and also that these lakes periodically overflow sometimes leading to a rapid break up of the overlying ice sheet as the floods cause it too flow more rapidly to the ocean. Has anyone found any info on lakes under the Greenland ice sheet ? I think at some point if assuming these lakes exist we can expect catastrophic break up events as they fill and flood. Why would they cause it to flow more rapidly to the ocean? Why would they fill(why aren't they already filled, if they're lakes), and why would that make the sheet move? The clathrate-filled Antarctic lakes aren't exactly active watersheds - from what I've read they're isolated occurences made possibly by tectonic rifts, geothermal heating, insulative ice, and extreme pressure. science on the issues does not make a lot of sense. by ice dams draining into the ocean. Put the physics together and it looks like we will see dramatic breakups of the ice sheets caused by flood events as these under ice lakes overflow. We know water causes the ice to move faster. We know these floods happen. Thats probably the main collapse mode once serious melting starts. of serious warming depending on the watershed and lakes. it via satellite when it happens. 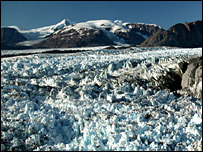 Volcanic eruptions under Icelandic glaciers have occurred within historic times. Massive flooding with flows comparable to the Amazon River. Icebergs left in pastures have taken a couple of decades to melt. One contra factor is that AFTER glaciers slide off (too much ice for the new equilibrium), I would expect thinner glaciers to reform "over time", even in a somewhat warmer climate. I'm studying GIS and we had a talk in our class from the guys at CReSIS, the Center for the Remote Sensing of Ice Sheets, at the U. of Kansas. They are doing a lot of the tech work involved in detecting ice sheet thickness in Greenland. In assoc. with U. of Maine and others. I think one of the key things to understand about climate change is that the issue is not that it will happen, or even necessarily that certain things are likely to happen; but rather the issue is the risk of very bad things happening. We can handle a certain amount of sea level rise over 100 years; it may be expensive, but that's a lot of time and with technological improvements and growing economies we may be able to afford substantial changes. When you look at the most likely scenarios and compare the costs to deal with them at the time versus the costs to make large reductions today in carbon emissions, using discounting, it is hard to justify in economic terms taking major steps. The problem is the risk of catastrophic change, things that can't be reasonably accommodated - a substantially larger increase in temperature than has been forecast, or great sea level rises, massive die-offs and ecological disruption, etc. These events are not considered likely, but science cannot rule them out. The fact that the current "error bars" of our best possible predictions include dramatic and disastrous possibilities is what we should be most concerned about in considering climate change, IMO. The costs of these extreme outcomes would be so great that it might be worth substantial expense and effort to insure ourselves against them, taking steps now to try to rule them out as possibilities. This is the best justification I know for efforts to forestall and prevent climate change, that we may be able to substantially reduce the risk of catastrophic outcomes.